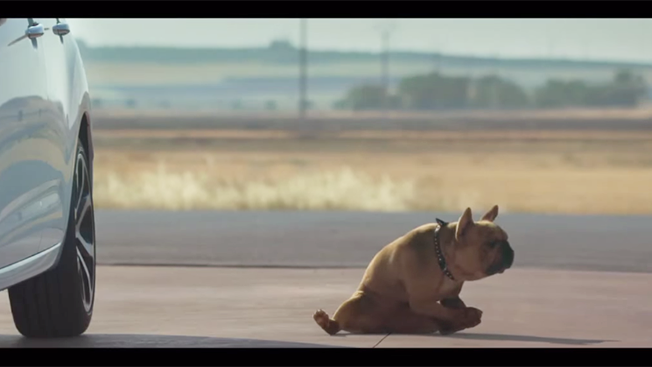 Citroen puts on the dog once again in this commercial with an anthropomorphized mutt who charmingly works out the muscle kinks and stiffness of a long drive when its owner pulls in to a desert gas station. The spot, from Les Gaulois in Paris, promotes Citroen's BlueHDi engine, which, according to the title card, allows drivers to "stop less often at the pump." Some versions of the ad substitute the line, "Next stop is in 1,520 km." That's a whole lot of miles in dog years. Directed by Control's Joachim Back, the lonely, sun-baked locations succeed at suggesting a winding, hours-long journey where the stops are few and far between. So does the use of "Sixteen Tons" on the soundtrack, which will now be rumbling through my head for the duration of my lifespan. Your enjoyment of the spot—a companion to Citroen's canine love story (I mean, woof story) from last year—will probably hinge on your attitude about ads where special effects are used to make animals and babies act like adult human beings. In my view, it's no stretch to say this puppy's a winner.